KE00027 is a solid phase sandwich Enzyme Linked-Immuno-Sorbent Assay (Sandwich ELISA). 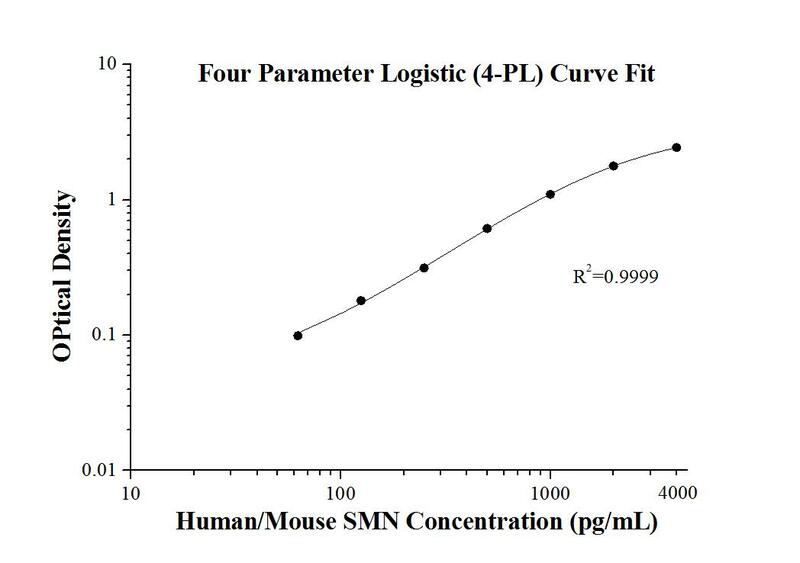 The SMN ELISA kit is designed for the quantitative determination of SMN in samples of human and mouse origin. A polyclonal antibody specific for SMN has been pre-coated onto the microwells. The SMN protein in samples is captured by the coated antibody after incubation. Following extensive washing, a monoclonal antibody specific for SMN is added to detect the captured SMN protein. For signal development, horseradish peroxidase (HRP)-conjugated Anti-mouse antibody is added, followed by Tetramethyl-benzidine (TMB) reagent. Solution containing sulfuric acid is used to stop color development and the color intensity which is proportional to the quantity of bound protein is measurable at 450nm with the correction wavelength set at 630 nm. Survival Motor Neuron (SMN) protein required for efficient assembly of small nuclear ribonucleoprotein (snRNP) complexes is encoded by nearly identical telomeric and centromeric forms of SMN gene respectively. Both the SMN1 and SMN2 genes express SMN protein, however, the amount of functional full-length protein produced by SMN2 is much less than that produced by SMN1 due to the alternative splicing.The SMN gene is constitutively expressed in wide variety of tissues including brain, kidney, liver and spinal cord, while motor neurons are particularly vulnerable to reduced SMN protein levels. Deletion or mutational inactivation of the SMN1 gene causes spinal muscular atrophy (SMA), a lethal genetic disease characterized by loss of motor neurons in the spinal cord. The absence of SMN1 can be partially compensated for by SMN2 and the SMN2 expression level is associated with SMA severity. This kit is for the quantitative determination of SMN protein level in vivo.